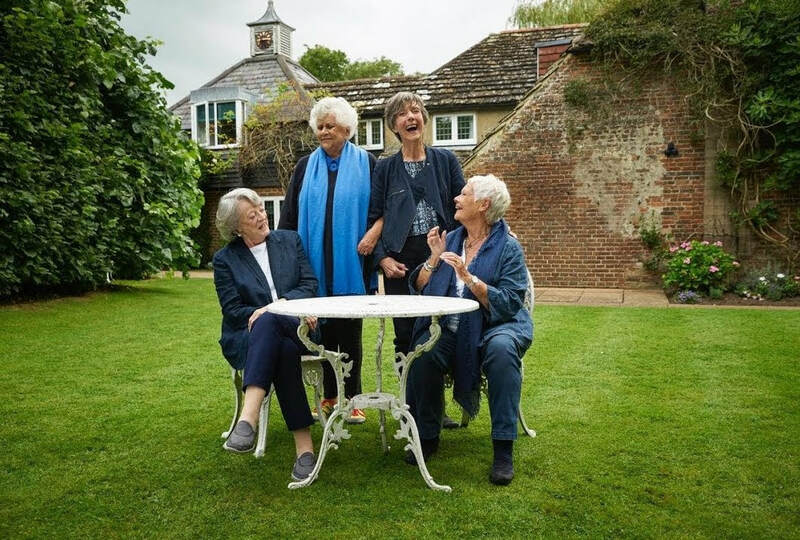 There may be nothing like a dame, but when the dames are a quartet of the most acclaimed British actresses in history—Judi Dench, Maggie Smith, Eileen Atkins and Joan Plowright—and you can see all four of them on the screen at the same time while they’re still alive and kicking the gong around, then lock the door, toss the key, and get ready to be knocked right out of your box. This bunch will never this way come again. From time to time, these great women, all friends of long standing (60 years and counting) and artists without peer who have been honored by the Queen, meet to sip tea, exchange gossip and trade memories. Tea with the Dames is one of those occasions, and being allowed to listen in like a fly on the wall and share a crumpet, you’ll feel like you’ve been knighted yourself. Call it a gabfest. Label it a talkathon. But Tea with the Dames, directed by Roger Michell, is so much more. Judi Dench, who has played everything from Queen Victoria to James Bond’s boss in the 007 movies, is also battling encroaching blindness, but carries on valiantly in plays and films as long as someone leads her by the arm to her marks. Eileen Atkins seems indefatigable, but as the day wears on, Maggie Smith confesses she lacks the stamina she once had that won her two Oscars. Turning to the camera, she confronts the director, asking “Roger, do you know how old we are? I’m tired.” They’re all in their 80s, but you would never guess. “But that’s what she was,” interjects dame Joan. Looking back on their early days leads to amusing anecdotes you won’t find in newspaper archives. Maggie Smith, who sang and danced in New Faces (“Pure camp!”), recalls that her first acting job after drama school was a Chinese boy in an opium den, the description of which sends Judi Dench into uncontrollable hysterics. Slogging through the wet garden in a typical English afternoon rain, they continue inside around the dining table, fully charged and ready for bear, their unscripted memories illustrated by valuable archival photos and films that demonstrate their talent and versatility in full blossom and prove why they’ve played every part and won every award. Dame Judi started out with Dame Peggy Ashcroft and Sir John Gielgud in The Cherry Orchard, directed by a nasty sadist who insulted her nightly until her co-stars taught her a valuable lesson in self-defense: “Never let them see you cry!” It’s a bit of wisdom she’s been passing on to young actors ever since. Moving on to discussions of politics, their legacy (Maggie Smith shows no enthusiasm for her Harry Potter movies and claims she has never seen a single episode of Downton Abbey) the critics (they profess to never read reviews, an assertion I contest with skepticism), and finally what it was like receiving “The Most Excellent Order of the British Empire” to become a commander—or, in lay terms, a Dame at last.